Americolors brilliant arrary of colors is an asset to any classroom. Heavy cut pile with no loops to unravel. Use alone or as a border to coordinate with any Flagship's printed carpet collections. 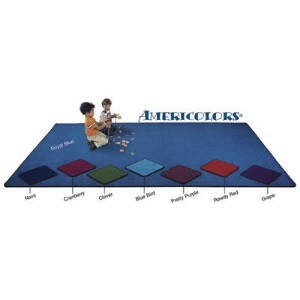 All 8 colores are available as wall-to-wall carpet. Grape, Navy, Blue Bird, Cranberry, Clover, Royal Blue, Pretty Purple, Rowdy Red.